It is a 50 x 100 thermal insulation board with flat edges and surface. 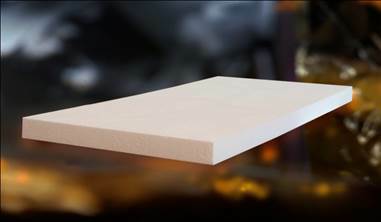 These expanded-polystyrene-based thermal insulation boards are manufactured in conformity with TS EN 13163 Insulation Products – For Buildings – Factory-made Expanded Polystyrene Foams – Specifications Standard. Cut from blocks that can be manufactured with various densities in 50 x 100 cm, thermal insulation board is an economical heat insulation material which is suitable to the harsh and changeable climate conditions of Turkey without any changes in its insulation value or physical structure when used within the scope of the standards. It is not suitable for use as an insulating material below 16kg/m³. It is infinite-lasting. Its insulation properties do not change over time. Its water vapour permeability is very high. This prevents water vapour from condensation, and moist and mould from growing on thermally-insulated walls. Owing to its features, it is able to successfully withstand the short- and long-term mechanical loads that are encountered in a building under normal conditions. It prevents expansion, shrinking and formation of cracks in the plaster, paint and coating that arise during working on the walls. It protects your building from outer atmospheric effects and prevents corrosion. It elongates the service life of buildings. It comes in blue and white colours. Note: In addition to standard dimensions, the boards can be cut to the desired sizes.